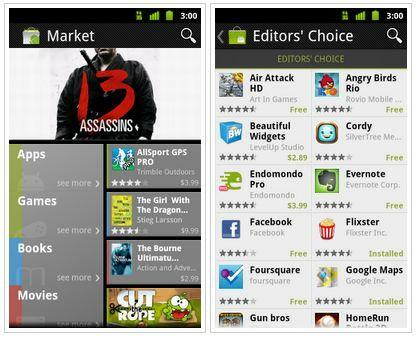 Google has just revamped their Market app for Android phones. The new look brings with it some new functionality as well. Users can now download books and rent movies right on their phones (currently US only). Apart from that there are separate tabs for Editors picks and Staff picks which will list the most popular and the top rated apps available on the market. This new addition was already available on the web market but was missing on the phone version. The whole app looks a lot more organized and sleek now so it’s certainly a welcome update. The update will roll out gradually but if you’re the impatient type hit the link below and download the apk. As always download and install at your own risk. The new market will only work on cellphones running Android 2.2 and above.